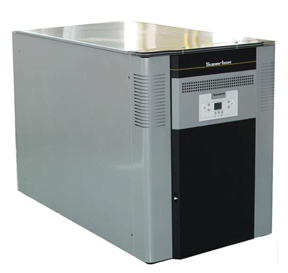 Superbox gas-fired commercial condensing boilers with stainless steel exchanger, pre-mix combustion technology and high modulation ratio. Available with heat outputs from 160kW to 1,060kW in stand-alone or cascade configurations. High net efficiency up to 106.4% thanks to pre-mix combustion technology and high modulation ratio. Low NOx levels, Class 5. Operates on a wide range of flow rates with low pressure drop. Long life due to stainless steel heat exchanger. Master control panel provides independent control of up to 3 different zones. Up to 16 Superbox boilers can be combined in a cascade configuration with no extra equipment. Compact design with easy and flexible installation.